My 8-year-old grandson is ready to start shooting - and his parents are ready to let him. Today I purchased a S&W M&P 15-.22 as the paltform to have him start with. I chose this because frankly, I wanted one. I don't have a larger caliber rifle, and this will be a good and economical way for both of us to train for the .223. Here is the eye problem: He wants to shoot right-handed and left-eyed. I don't see how that will work. Any others who have dealt with this? All suggestions appreciated. As a person who is left handed and left eye dominant, many people tried to teach me to shoot right handed and write with that hand as well, it was uncomfortable. It is much easier to shoot left handed left eye, right handed right eye. I train to use either hand and either eye. I am much more accurate with my left side than my right, but at across the room distances it is difference that makes no difference. He wants to shoot right-handed and left-eyed. The first place to start is with an eye doctor. Is he simply left-eye dominant, or has he got a correctable (or uncorrectable) problem with the visual clarity from the right eye? After thinking about it and watching my grandson "aim" a toy, I believe I know what the problem may be and where to start. It turns out he can close his right eye, but is unable to close the left eye - so that is the one he uses. It occurred to me that closing one eye is unnecessary. Holding the muzzle of a toy gun (right-handed), I had him open both eyes and use the right eye to look down the sites until he was looking me in the eye with his right eye. I will instruct him to use the right eye on the sights and focus it primarily on the far sight, while allowing the left eye to remain open and focused on the target. Check his eye dominance and let him shoot with the dominant eye. He'll be way ahead when he wants to shoot handguns and especially shotguns as he grows. The only negative is the rifle you have chosen (because you want one) may eject empties into his face or down the front of his shirt (typical with the M16, but I've not been around the S&W .22 cal version). My grandson is (understandably) resistant to changing to a left-handed shooter. Instead, I will attempt to train him to use his right eye on the sights. As I said, I think the problem is his inability to close his left eyelid (rather than a dominant eye issue). Before we go shooting for the first time, I will set him up with the unloaded rifle on a bench-rest and work on this. I'll start out with a "pirate eye-patch" on his left eye and see how that works. If you're not cross-dominant, there should be no problem with shooting with both eyes open. I've read that some cross-dominant folks have successfully and permanently switched eye dominance by wearing a patch on the dominant eye for a few days - but not being an eye doctor, I can't actually recommend this approach, especially for a child. It's not uncommon for precision shooters to put a piece of translucent tape on their shooting glasses over the non-aiming eye to save themselves the strain of closing one eye, assuming they dislike shooting with both open. They'll usually position the tape to obscure their downrange view when in shooting position, but can still look around it when doing things like loading magazines. Pay attention - the inmates really are running the asylum. Sixty-four years ago I was the kid in your grand sons place. There is no question that I am left eye dormant and I am probably right handed. It is possible I had sub clinical case of Polio that slightly weakened my left side when I was 4 or 5 switching me from a lefty to right handed. I am equal inept with either hand. I recommend you take your grandson see a eye doctor that understands eye dominance problems preferably one that's a shooter so he understands our problems and not someone that believes all left-handers should be left alone with out knowing the price a left-handed shooter pays. It would be great if you could find a left-handed eye doctor that's shooter who has had hot brass in the face and paid for his own left handed Mauser who has paid the price a left-handed shooter pays and knows the price people pay for trying to change eye dominance. It is something that you don't want to mess up. Kids have way to much stress on them anyway adding more over trying to learn to shoot with the wrong eye will not help him enjoy shooting. I just wish he had the target rich environment I had of jumping a jack rabbit every 5 to 10 minutes and more land than i could hunt to find them on. Fortunately it is much easier to get left handed guns. Modern Machining lets one make a mirror image of the plans and with a few changes you have a left handed gun. But he will miss out on many old guns that are fun to shoot. If your grandson is a left handed as my left-handed bother or grand mother shooting left handed is best. When she was my age now my grandmother was a better shot than I was at my best. And that was with my gun she had never used after a dry spell of 30 or 40 years with out shooting. When I first shot a rifle it was Remington 241 22 that ejected out the bottom. I picked up right handed then left handed. I shot better left handed. Dad told me, "while it made no difference with the 241 most guns ejected to the right or were made to be operated right handed. If I could learn to shoot right handed I would have the choice a many more guns and would not get hot brass in my face, down my shirt and in my right shirt pocket." I took his advice. He never gave that advice to my brother. His right hand was for picking things up big things out of reach of his left hand. Now I shoot mostly right handed but switch to left if my right side gets sore when I shoot trap with a borrowed Franchie that slaps me in the face. If the shot is easier to take left handed I just need a better rest for heavy gun. I have no trouble shooting with both eyes open but use my left eye to shoot a pistol. I probably shoot a long gun a bit better right handed and I know I shoot a pistol better form my stronger right hand. My right handed brother could take my Remington 6mm and kill Prairie Dogs at 450 yards using my ammo. That was a full 60 or 70 yards further than I could reliably kill them the same day with the same gun and ammo. I strongly feel I would shoot better if I shot with my dormant eye on my dormant side even when i was killing 95% of the jack rabbets that got up within 100 yards of me using a Remington 241 shooting 22 shorts. To give you an idea how serious it is to i found searching for ways to co-witness scopes for the left eye with iron sights for the right eye or visa—versa. I also carry a black patch in my shooting bag for target shooting if I rules allow. Welcome to the forum OldRed - and thanks for the interesting first post. Due to a number of unavoidable family circumstances, I was not able to take my grandson to the range and have him try out the AR-.22 until a few days ago. My collection of classic S&W revolvers are kept in a locker there, and he was quite impressed with those. It was the first time he'd seen them. He thought it would be easier to start with the .22 revolver - until he realized it was quite large and heavy for him yet. I assured him that he and his little brother will own them one day...but not anytime soon! As he is definitely right-handed (and of course the brass ejects to the right) - I set him up that way with tape over the left side of his shooting glasses. This worked well for him, and he did just fine getting his shots on the paper. Just as we began our session in an empty room, a fellow set up on a nearby lane and commenced firing a .45. My grandson has always had particularly sensitive hearing, and even though I had installed soft plugs and covered those with hard ear muffs - the concussive effect was too much for him. I wanted to avoid making this an unpleasant first experience, so I had him shoot out the 25-round magazine and we packed up and left. He asked me why the .45 didn't bother me, and I explained to him that it does make me flinch at first in close quarters, but then I get used to it and settle down. I assured him that with time he would get used to it as well. He replied, "Even though I LOVE guns, I don't known how I would ever get used to that." I told him we'd go out in the woods this Spring and find an isolated spot to shoot. He was all for that! My question: Do any of you have this problem with a youngster? Is there anything else I can try besides the double ear protection? I am right handed, strongly left eye dominant (amblyopia or lazy eye,) and concur with the recommendation that an ophthalmologist or optometrist be consulted. I liken my first experience on an open firing line next to a 1911 shooter to taking a pillow to the face in a pillow fight. To compound the memory, my open collar caught a hot empty. (Thanks... I'll move down the line.) An impromptu range on BLM land has served far better than our local club range for introducing new shooters to the game. My grandson's problem is that he is unable to independently close his left eye. When I covered it, he seemed to have no problem sighting with the right eye. Once he becomes habituated to sighting with his right eye - I'll try removing the tape and encourage him to keep both eyes open with his right eye on the sights. An isolated outdoor session is in our future for certain, and I like the idea of a tarp for easy clean-up. In reviewing this thread, I realized I hadn't taken my Grandson shooting in a long time. Yesterday, after spending a great day together doing other things, I told him I was going to go shooting in the evening at my gun club - which happens to be just up the street from them. He declared he wanted to go with me. I mounted a red dot sight (off my Colt AR) on the M&P 15-.22, and when he tried looking through it from his left shoulder with his left eye - he told me it was MUCH easier. We set up with a stool and a bench rest, and double ear protection. After I dialed in the red dot for 5 yards - he consistently chewed up the center of the target shooting left-handed and left-eyed, and was quite pleased with himself! The ejecting brass posed no problem at all. He did a great job running the gun, maintaing strict safety protocols by keeping his trigger finger indexed until ready to fire and engaging the safety after emptying the magazine and before removing it to reload. Last edited by ragland; April 3rd, 2014 at 02:21 AM. I just found this tread again. Fortunately we have many more choice in bottom & front ejecting guns that we had 60 years ago that can be shot left handed. We also have more money to spend on them and they hold their value better. Most of us can learn to shoot with our weak side easier than we can with our weak eye. A 22 pistol is the place to find out. Red Dot's or offset sights also work well for cross dormant shooters. Don't let kids around big loud guns with lots of recoil Until their ready for them. I haven't even let my wife shoot full bore 9mm's yet in a very soft shooting CZ-75 Compact. The big noisy kicking stuff comes later. I have good genetics I hunted with a converted Riot gun with a Polly Choke and Cutts compensator. They sound off at 171+ db. Full loads of 357 magnum in a 3 inch barrel sounded louder than that. That's in the days before ear protection. I have a little hearing loss but not as much as most farmers my age. I complain to my wife about the TV being too loud. 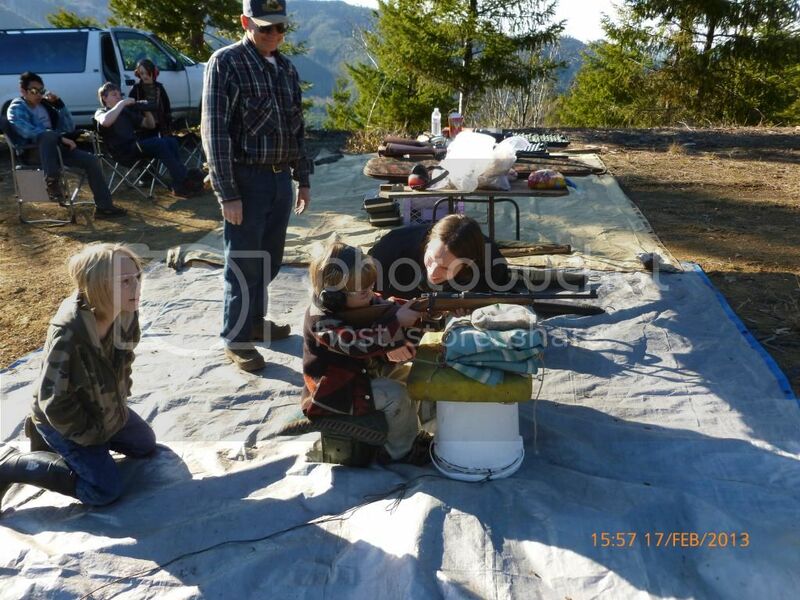 They will not notice the notice and recoil when their having fun shooting the larger guns. But start them out in the open not in concrete room.